Blazing Hot Wok: Regional Recipes: Little Shoes! 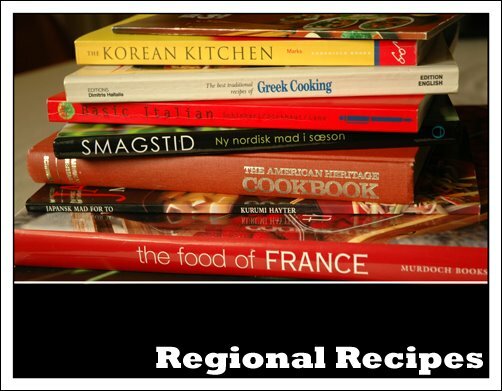 I want to remind everyone that I’m hosting Regional Recipes this month, and the region is Greece! If you want to join in, you still have a few more days. The deadline for submissions is October 15th and I’ll post the round-up on the 20th. You can read more about it, including the rules, here. My submission is Greek stuffed eggplant, also known as “little shoes,” because they look like shoes (surprise!). This is probably my favorite of all the Greek dishes I have tried. Well, this and moussaka, which are basically the same thing. My favorite part of this dish is the bechamel sauce on top. If you are familiar with it, you probably agree it’s one of those standard sauces everyone should know. It’s perfect for topping so many different casseroles. It's got a mild, buttery flavor, but once you get the basic recipe down, you can begin to incorporate different flavors. In fact, I did a version with chopped spinach that was very delicious. I'll try to get a recipe up in the near future. In the meantime, enjoy the "little shoes". Some people prefer to hollow out the eggplants before cooking them, but I find it easier to do when they are softened. Whether you do it before or after cooking, it’s going to take some patience to scrape out the pulp without tearing into the skin. You want to end up with a nice “boat” with about ½ inch of pulp still attached to the skin. If you do decide to do it before, you’ll still need to bake the boats before filling them to ensure the eggplant is sufficiently softened at the end. Cut the eggplants in half lengthwise and sprinkle each face liberally with salt to draw out some of the bitter juices. Let the eggplant halves sit for at least 15 minutes. After that time, rinse off the salt and pat dry. Rub a little oil on the faces and roast them skin side up in a 350F oven until tender but still able to hold it’s shape, about 30 to 45 minutes. If the skins start to burn, tent with foil. Once the eggplant is cool enough to touch, scrape out most of the pulp (keep a little attached to the delicate skin) and reserve it. Try not to rip the skin! It needs to be able to hold the filling. In a large skillet over high heat, add a little olive oil and brown the lamb with the onions. Before adding the remaining ingredients, you may wish to drain off some of the fat, if there seems to be an excessive amount. Add the reserved eggplant pulp, garlic and tomato and tomato paste. Allow the filling to simmer until some of the moisture is evaporated. Don’t let it get too dry, though! Add salt and pepper to taste. Don’t be shy with the salt, I think I used at least 1 tsp of kosher salt and I think I should have used more. When you turn off the heat, add the chopped herbs. Adding them at the end preserves their flavor so you’ll actually taste it in the filling. 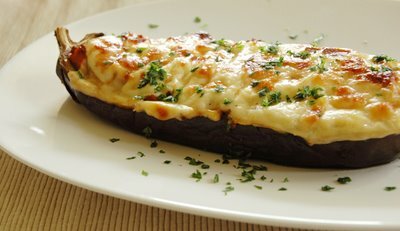 Arrange the eggplant in a baking dish and fill them. Set aside while you prepare the béchamel sauce. To make the béchamel sauce, melt the butter with the olive oil in a medium saucepan over low heat. Add the flour and whisk to make a roux. Cook the roux for 1-2 minutes, but don’t let it brown. Then slowly add the hot milk while whisking vigorously. The mixture will clump, but keep whisking and it will end up smooth. Add the salt, pepper and nutmeg. Remove from the heat briefly and whisk in the eggs. Put it back on the heat and cook over low for maybe another 5 minutes, stirring frequently. Watch that the bottom doesn’t burn. The sauce should be thick, like a pudding. Adjust flavor with salt. Another option is to add 1/4 cup grated Parmesan cheese. When the sauce is done, spread it over the filled eggplant. If you can’t use the béchamel immediately, transfer it to a heat-proof container and press some plastic wrap on top to keep a skin from forming. Don’t wait too long to use it either. When it cools it will be quite thick and gelatinous and difficult to work with. Sprinkle 1 tbs of the crumbled feta on top each “shoe” and bake in a 350F to 375F oven until heated through and starting to brown on top, about 30 minutes or so. Allow to cool for 10 or 15 minutes before serving. It’s best warm, not piping hot. Depending on the size of your little shoes and the side dishes you serve (salad, roasted potatoes or bread are perfect), one half will probably be enough for each person. I LOVE these! Mmmm YUM!! Great picture too. Wow! I've never had eggplant prepared this way! As soon as I read that it has lamb in it, I was hooked! There's just something wonderful about lamb and eggplant! This makes such a pretty presentation, too. Your instructions are great, and now I want my very own little shoe! Omigosh Darlene, these look too good. My stomach is grumbling and my mouth is watering, seriously (I didn't have breakfast and it's only 10:44AM). I LOVE moussaka (even if I've only had it once) and I'm sure I'll love this too. That looks absolutely delicious. And what a cute name! 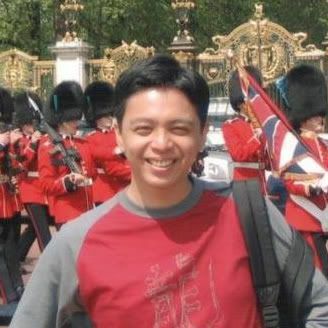 jan, aren't they great? I had these for the first time while I was living in DK. Paula, I agree about the lamb and eggplant. I was just down at the Mad Greek in Beaverton with my family. They have the most delicious "fries" and pistichio (sp??). manggy, yes, if you like moussaka, you'll definitely like this! Lars, you snooze you lose :-) I'm sure you can come up with something delicious. Maybe a modern interpretation of a classic dish, which you are so good at. Ooooh, yummy. I love eggplant, and the feta cheese combo sounds terrific.